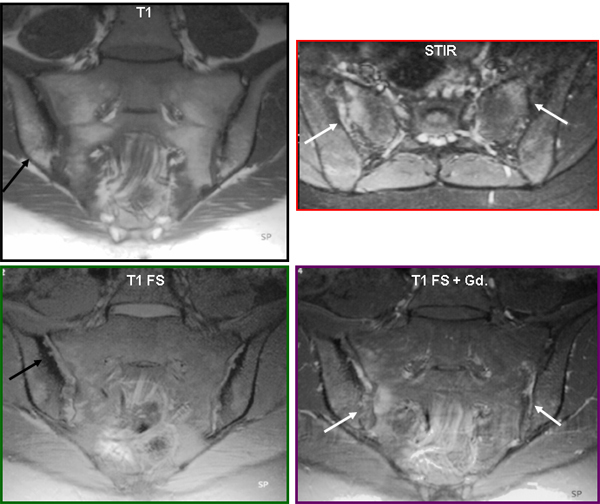 Screening for sacroiliitis requires the following MR sequences: Semi-coronal T1-weighted sequence with regard to erosion and fatty marrow degeneration and semi-axial STIR to detect activity. Additional semi-coronal T1 FS (or gradient echo sequence) may be needed with regard to minor erosion which is not always visible on T1-weighted images. To assess the presence of vascularised changes supplementary semi-coronal and/or semi-axial T1 FS after intravenous Gd. contrast is needed. This can show enhancement in the bone marrow, erosion and/or joint space. The images below illustrate typical findings marked with arrows.